A man befriended a frail 86-year-old and embezzled more than £1,600 from her. Laurence Galloway told the elderly woman he was impoverished and had no heating in his flat. He would go to her Melrose home, make her breakfast, and help with her ailments. But the 53-year-old, who had debts at the time, embezzled money from the lady, who has since died, after being entrusted to collect her pension and benefits. Galloway, of Priorsdene, Melrose, admitted embezzling £1,600.80 at Melrose Post Office, on various occasions between October 7 and October 24 last year. Selkirk Sheriff Court heard on Monday how the accused was introduced to the woman by a mutual friend some seven years ago. The lady suffered from arthritis, and was house bound, getting around on a zimmer frame. She lived alone, receiving a weekly pension and monthly benefits. “He told her he was impoverished and had no heating in his flat,” explained procurator fiscal Graham Fraser, “and he would come to her house and make her breakfast, and rub cream on her legs, required to help her circulation. “He said he would collect her pension, and had been given her PIN and card,” added Mr Fraser. Mr Fraser said Galloway had taken advantage of the situation, adding that the elderly lady had since died. Defence solicitor Ed Hulme said his client had no previous convictions for dishonesty. “He had accrued some debt at the time, and was also drinking,” explained Mr Hulme. He said Galloway was now “back on his feet”, living alone with his pet dog. “His intention is to repay the money,” concluded Mr Hulme. Sheriff Peter Paterson described the offence as a “manifestly unpleasant and selfish crime. “It is the sort of offence that society looks dimly on, particularly given the nature of the victim,” he added. “A custodial sentence is uppermost in my mind, but I will call for reports to see if there is an alternative,” he told the accused. Sentence was deferred until January 18 for reports. A 63-year-old man appeared in private, charged with attempted extortion in Selkirk. Robert Munro, of Grosvenor Street, Edinburgh, appeared on petition and was remanded in custody by Sheriff Peter Paterson. He made no plea or declaration, and the case was continued. The offence is alleged to have happened in Selkirk during 2014. A man appeared in private charged with fraud in Galashiels. David Jeffrey, 35, of Laidlaw Court, Galashiels, appeared on petition charged with a fraudulent scheme in Galashiels between August 2014 and August this year. He made no plea or declaration, and was released on bail. Two men have been charged with assault to severe injury in Galashiels. Forty-six-year-old Kenneth Reid, of Dunsdale Road, Selkirk, and Kieron Reid, 25, of Sinclair Gardens, Edinburgh, are both alleged to have committed the crime last Friday. They also face a charge of racist abuse, while Kieron Reid is charged with a further assault. Both accused appeared on petition and made no plea or declaration during a private appearance. The case was continued and they were released on bail. A Peebles man has appeared in private accused of assaulting three people. Neil Cruickshank, 34, of Horsburgh Castle Farm Cottages, is charged withcommitting assault to severe injury and permanent disfigurement in Innerleithen on Sunday. He is also charged with two further assaults in the town. Cruickshank made no plea or declaration when he appeared on petition on Monday. The case was continued and he was released on bail. A woman will spend Christmas and New Year in custody after being remanded for trial. Amanda Williams, 35, of Talisman Avenue, Galashiels, appeared from custody and denied threatening or abusive behaviour at Talisman Avenue last Friday. She is alleged to have spat at her partner and repeatedly struck windows. Williams will stand trial on January 21, with an intermediate hearing on January 5. A careless driver who overtook when it was unsafe to do so was fined £250. Anne Isles also had her licence endorsed with five penalty points. The 59-year-old, of Brunton Park, Bowden, admitted driving without due care and attention on the A703 between Eddleston and Peebles on September 10, overtaking when unsafe, approaching a blind bend. “This a particularly notorious spot, and police were keeping a check,” explained procurator fiscal Graham Fraser. Defence solicitor Ed Hulme said his client was not driving her own car. “It was an error of judgement over how powerful the car was,” he explained. A Kelso man who struggled with police has been sentenced to a 12-month community payback order. Daryl Wilson has also been ordered to carry out 120 hours of unpaid work, and pay £100 compensation for damage he caused. The 26-year-old, of Maxmill Park, pleaded guilty to attempting to force entry to a flat at Beech Avenue, Galashiels, on September 13, and struggling violently with police. He also admitted breaking a pane of glass in a front door. Sheriff Peter Paterson warned Wilson the sentence was a direct alternative to custody. A police officer was placed in danger by a man who had a syringe containing blood. Rhuaridh MacLeod, 23, of Scott Crescent, Selkirk, failed to tell the officer after he was detained for a search at Stirling Street, Galashiels, on August 29 last year. MacLeod had a hypodermic syringe containing blood and an uncapped needle. He was sentenced to an 18-month community payback order with 180 hours of unpaid work. Sheriff Peter Paterson warned that the sentence was a direct alternative to custody. A man assaulted a mechanic to his severe injury following an argument. Fifty-seven-year-old David Drummond, of Main Street, Tweedmouth, appeared on indictment and admitted the offence which happened at East End Garage, Main Street, Chirnside, on April 10 last year. The court heard how Drummond punched the man on the face. The victim, who was also assaulted by Drummond’s 36-year-old son, suffered a broken jaw. Drummond was sentenced to an 11-month restriction-of-liberty order, to remain at his home between 7pm and 7am each day. A 16-year-old made racially-offensive remarks to a hospital employee. The teenager, who cannot be named for legal reasons, received fines totalling £350 and was also ordered to pay the same in compensation. He admitted acting in a racially-aggravated manner at Borders General Hospital on March 27. He was fined £100 and ordered to pay £200 compensation. 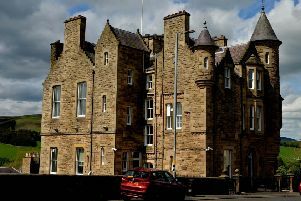 The 16-year-old was also fined £150 after he admitted uttering threats of violence to police and their families at Galashiels police station on the same date. He received a £100 fine, and was ordered to pay £150 compensation, after he admitted assaulting an employee at Borders General Hospital by spitting at him. A man assaulted another with a bottle to his injury in Hawick on New Year’s Day. Greg Bain, 33, of Wellfield Road, Hawick, appeared on indictment and pleaded guilty to striking a man on the head with a bottle to his injury at Mansfield Gardens on January 1. Sentence was deferred until January 18 for a psychiatric report. Bain had sentence deferred on a further complaint until the same date for abusive behaviour on September 21.